The latest State of the American Traveler highlights some growing differences in how different generations of American travelers plan and undertake travel. The July 2015 (summer) edition of this major bi-annual study of American leisure travelers for the second year focuses specifically on the travel patterns of different generations of Americans. The study is undertaken by leading San Francisco-based research company, Destination Analysts, and is sponsored again by Miles (as it has been for the last nine-plus years). The generational differences appear to be more pronounced than ever in the 10-year history of the research study – and perhaps are at their greatest since Baby Boomers themselves reshaped travel and tourism from the 1960s onwards. Download a copy of the July 2015 State of the American Traveler. The State of the American Traveler, almost a decade old, has never reported a more positive travel environment. Americans are feeling bullish about their travel prospects in 2015 – 2016. Barriers to travel such as gas prices and the perception of costly airfares are at their lowest level in the almost 10 years of the study (despite airfares actually rising since the airline industry consolidated). It is a market of opportunity – make sure you have a smart marketing plan and budget to take advantage of it. However, challenges remain. One of them is the high value of the US dollar, which makes the US a more expensive destination for international travelers (who spent $222 billion to travel to and within the USA in 2014; source: US Travel Association/Brand USA). Another impact is that the rest of the world is on sale – international destinations are cheaper than in many years, enticing Americans to plan international travel. And there are more international DMOs – spending more money than ever before in the history of travel – encouraging Americans to visit. Domestic destinations will need to work harder to remain relevant, exotic and exciting to US leisure travelers – especially Millennials, who are three-times more likely than Baby Boomers to be planning international travel in the year ahead. The study emphasizes the importance of clearly understanding your audience and then creating, curating and delivering content in a highly targeted and personalized way to your prospective traveler. Make sure you hit your mark. The differences in the interests, media use and actual travel behavior of Gen Y/Millennials vs. Baby Boomers is in a number of significant areas. Make sure you have the deep, rich and specialized content and a distribution plan to get this message to the right people at the right time via the right device and media. Reaching travelers via the right device and media is becoming even more complex. 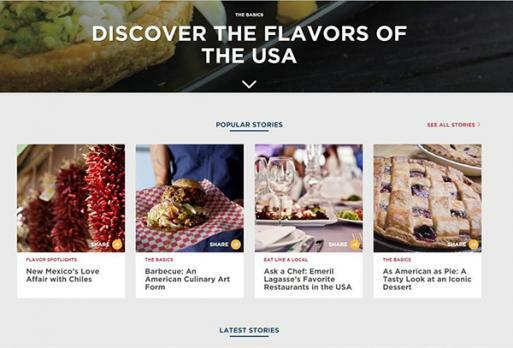 The latest State of the American Traveler highlights that across almost every media and content type, that travelers are accessing more information from more places – both digital and traditional media. Social media and user-generated content both surged as sources of information (to 48% and 46% respectively of US travelers) – however, print usage also topped 50% for the first time in the history of the research. Every marketing plan needs to support a complex and ever-growing range of media types and channels – making engaging content and smart analytics even more important. Mobile usage also grew to 50% of US leisure travelers now accessing a smartphone in travel planning, with 34% using a tablet. Both are record rates. In an increasingly mobile-centric world, destinations appear to be struggling to get users to engage with their digital channels in market – while visiting the destination. 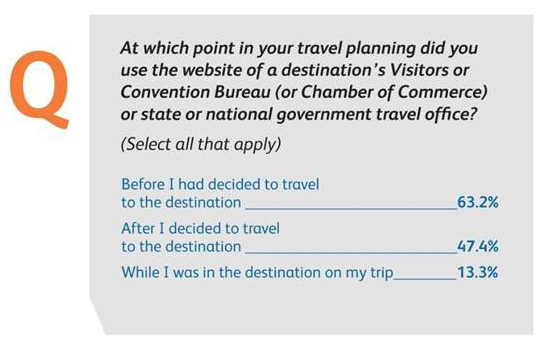 Only 13% of travelers reported using a DMO site while traveling in the destination. To retain the reach and longtime impact generated by visitor guides distributed in market over many decades, DMOs must focus on the specific content needs and functionality of in-market visitors and locals. Content such as Events, Things to Do (especially for younger travelers and families), Dining/Nightlife and Maps are all critical. More on this and the challenge of making your mobile solution “In-Market Ready” in a future blog.